Tua Tagovailoa heroics in the National Championship game to guide the Alabama Crimson Tide to the title last season have not guaranteed him the starting quarterback position for the 2018 campaign. The back-up emerged from the bench in the second half of the contest, with his side in need of a spark on offense after they failed to score a point in the opening 30 minutes. 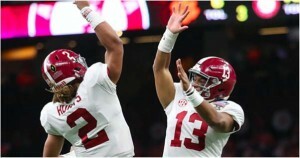 Tagovailoa replaced starter Jalen Hurts, who had played extremely well over the course of the season to put his team in position in the Championship game. However, it was the backup, who produced the comeback, although Andy Pappanastos missed field goal sent the game into overtime. The pressure was on the freshman to deliver after Rodrigo Blankenship put the Georgia Bulldogs ahead with a field goal. Needing a response Tagovailoa was sacked on first down by Davin Bellamy. On the next play, he won the title for his team by arcing a deep strike into the hands of DeVonta Smith for a 41-yard touchdown. Despite his achievement, head coach Nick Saban has insisted that there remains an open competition for the quarterback position. Saban will have questions over a lot of the areas of his team entering the new campaign. Not for the first time, he has to rebuild following the mass exodus of his talented players to the NFL. Da’Ron Payne, Rashaan Evans, Minkah Fitzpatrick, Ronnie Harrison, Calvin Ridley and Anthony Averett were among the high-profile departures. Alabama is blessed with a strong recruiting class year after year and their stocks will be replenished, especially on the defensive side of the ball. Therefore it’s not a surprise to see them considered the leading contenders for the National Championship once again. Tagovailoa has already proven his credentials on the major stage, but whether he will be able to maintain his form over a longer period of time remains to be seen. Damien Harris has three years of experience behind him and he will be looking to stake his claim to be the next Crimson Tide running back to be selected in the first round of the NFL Draft. He will anchor the offense with more importance placed on the running game following the exit of Ridley. However, Jerry Jeudy, Henry Ruggs III and Smith will all be keen to show that they can rise to the occasion. As a result, it could be well worth backing Saban’s men at 5/2 with William Hill in the college football betting odds given their talent on the offensive side of the ball. The Crimson Tide are stacked once again on defense. Raekwon Davis returns to anchor the defensive line following his impressive 2017 campaign. More will be expected of him after Payne’s exit. Mack Wilson will inherit the middle of the defense from Evans in light of Terrell Miller’s ACL injury. Christian Miller and Dylan Moses will be vying for the two spots next to Wilson, although the depth behind them is not overly encouraging. The secondary took a hit with the loss of Fitzpatrick and Harrison, with the former arguably being one of the finest players to emerge in recent history. Deionte Thompson and Xavier McKinney have a huge challenge on their hands to ensure that the two safety spots remain a position of quality for the team.